in Random things of Interest on April 09, 2019 . 0 Comments. With Easter here, we thought we'd take a look at some Easter foods from around the world. There are many rich traditions to explore and some traditions which seem to cross borders. Here are our favourites! 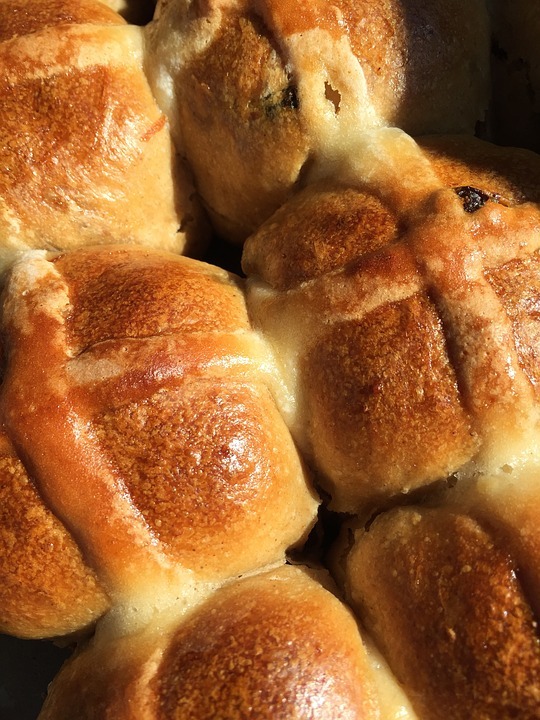 Hot cross buns are a delicious bread that is normally served toasted and buttered. It is traditionally made without dairy products, towards the end of Lent. Each part of the bun is tied to the religious Easter theme, from the cross on top of the bun representing the crucifixion of Christ to the spices used inside the bun representing the spices used during Christ's burial. This traditional Easter bread has a fascinating history, from its name to the way it's made. A 'mona' was a type of food made by Muslims to feed their masters when Spain was occupied by the Moors. The name stuck, but during Easter week, a bread was developed that was cooked with eggs on top. This type of bread is eaten all over the Mediterranean and isn't unique to Spain. What is unique is that now the recipe contains chocolate eggs ontop and has a layer of apricot jam inside. It is traditionally given by godparents to their godchildren. In Russian Orthodox traditions, they serve Paskha. It's made from cheese, butter, eggs, sour cream, raisins, almonds, vanilla, spices and candied fruit. The desert can be baked or it can be made raw. Each ingredient represents certain aspects of the Easter Story. The white of the cheese curdles represents the purity of Christ for example. Fanesca is a soup that is traditionally served the week leading up to Easter Sunday. It takes a long time to prepare due to the sheer amount of ingredients the soup has. It contains different kinds of pulses, cassava, pumpkin, milk, cream, cheese, peanuts, sweetcorn and salted cod. If that wasn't enough, it's served with any variation of toppings, including eggs, fried plantain, avocado, empanadas (fried savoury pastries) and more cheese. Each region in Ecuador will have its own version of Fanesca. This intriguing desert is served during Easter in Finland. The traditional way to prepare this is to mix rye flour with water, malt, salt and orange zest. It is left to naturally sweeten slowly and then baked. It is cooled and served a few days later with cream. Its taste is akin to a dark rye bread with a granular texture.